The Ministry of Health and Social Development today launched their information campaign to educate the public about the function of the Parole Board and its impact on the community. Parole is the supervised conditional release of a prisoner before the completion of his or her prison sentence. 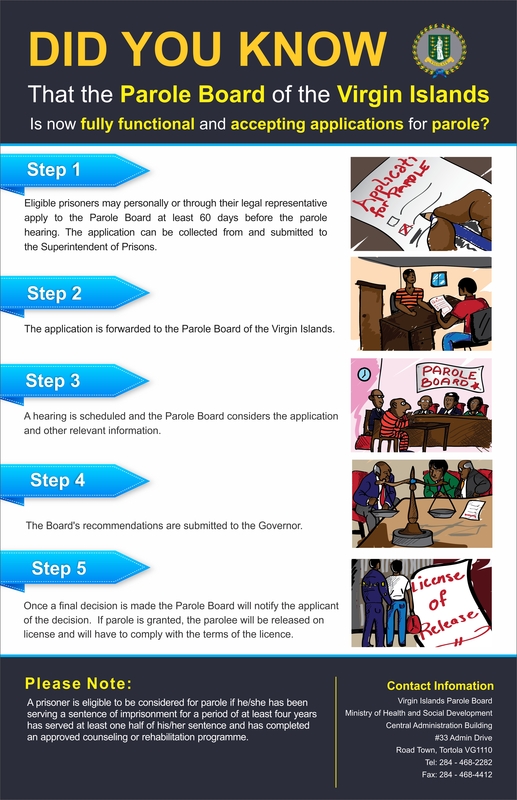 The Parole Act of 2009 established the Parole Board of the Virgin Islands. The board’s primary responsibility is to ensure public protection by making informed parole decisions and to successfully re-introduce qualified offenders into the community through supervised conditional release. Deputy Secretary in the Ministry of Health and Social Development, Mrs. Natalie Fahie-Smith said the purpose of the campaign is to educate inmates and the community on the role and function of the Parole Board and to clearly outline the process for obtaining a parole hearing. The educational campaign will run for the entire month of October and will focus on topics such as the vision and mission of the Parole Board, how to apply for parole, considerations of the Board when reviewing parole applications, public safety as part of the parole process and responsibilities of the parolee. The information will be disseminated through a multi-media approach including press releases, radio and television interviews and commercials, online ads, the distribution of posters and brochures and the use of social media. The community is encouraged to learn more about the Parole Board and understand its functions and processes. The Parole Board is committed to the improvement of the quality of the criminal justice system on behalf of the citizens of the Virgin Islands and seeks to achieve this through a deep concern for public safety, consideration of the victims of the crime and the rehabilitation of offenders.